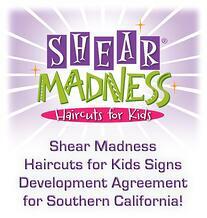 Shear Madness Franchising LLC, was founded in 2010 to expand the Shear Madness Haircuts for Kids concept that was originally opened by Paula Thurman in 1997. Combining the magic of childhood with kids haircuts, parties, salon services and a fantastic kids boutique filled with toys, hair products, jewelry and more, Shear Madness currently has franchise locations open in Kansas, Missouri, Texas, Iowa, New York and New Mexico. For additional information contact Jim Otto, Director of Franchise and Corporate Development, jim@shearmadnessfranchising.com.